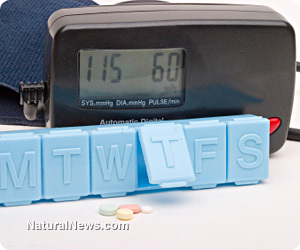 (NaturalNews) If you are a woman and you take calcium channel blockers like amlodipine (Norvasc) or nicardipine (Cardene) to manage your high blood pressure, you could be putting yourself at serious risk of developing breast cancer. This is according to a new study recently published in the journal, JAMA Internal Medicine, which found that women who take such drugs have about a 250 percent increased risk of developing some of the most common types of breast cancer compared to other women. Dr. Christopher Li and his colleagues from the Fred Hutchinson Cancer Research Center in Seattle, Washington, learned this after evaluating several groups of women, some of whom currently have breast cancer and have been taking calcium channel blocker drugs for many years. Compared to women not taking the drugs, the drugged-up women were found to be significantly more likely to have either ductal or lobular breast cancer. As covered by Reuters, the observational study involved nearly 3,000 women, 905 of whom had been diagnosed with ductal breast cancer between 2000 and 2008. Another 1,055 of the women had been diagnosed with lobular breast cancer during this time, while 891 are currently breast cancer-free and served as the control group. Among all the women, roughly 40 percent from each group had taken or are currently taking calcium channel blockers for high blood pressure. After analyzing drug usage rates among all the groups and comparing this data to rates of breast cancer, the research team discovered that, compared to those without breast cancer, more than twice the number of women with either form of breast cancer had been taking calcium channel blockers for 10 years or longer. In the ductal and lobular breast cancer groups, the number of women taking calcium channel blockers for 10 years or longer was 25 and 26, respectively, while only 11 of the women in the cancer-free group had taken the drugs. This calculates, of course, into a 2.4- to 2.6-fold increased risk of breast cancer among women who take calcium channel blockers, which is a significantly elevated risk. And while this data does not necessarily serve as undeniable proof that calcium channel blockers cause breast cancer, these shocking findings do suggest that the drugs, nearly a billion prescriptions of which were filled in the U.S. in 2010, deserve far more scrutiny from a safety standpoint. "Characterizing the associations of ... [calcium channel blockers] with the most common cancer in women is an important clinical and public health issue, particularly with the increasing availability of alternative options to manage hypertension," said Dr. Li, lead author of the study, about the findings. Though the exact mechanisms through which calcium channel blockers lead to higher rates of cancer is still not fully understood, researchers believe it may have something to do with the way the drugs affect the body's natural ability to induce cancer cell death. According to reports, researchers familiar with the process say calcium channel blockers may increase intracellular calcium levels, which in turn prevents cancer cell apoptosis. "Quantification of the potential relationships between use of these medications and breast cancer risk has the potential to aid clinical decision making regarding selection of antihypertensive agents for patients with hypertension, as the benefits and risks of potential medications are weighed," added the authors in their conclusion, while at the same time recommending that women continue taking the drugs in question in order to avoid developing heart disease.